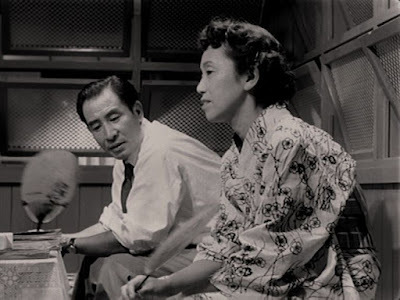 Yasujiro Ozu, the much-admired and revered Japanese filmmaker who flourished from the end of World War II until his death in 1963, was renowned both for his characteristic focus on Japanese middle-class family culture and his distinctive mise-en-scene. Accordingly, he is often ranked, with Kenji Mizoguchi and Akira Kurosawa, at the top of the list of great Japanese filmmakers. However, it took some time before Ozu’s greatness was generally recognized in the West. His work was thought to be too “Japanese” for export overseas. 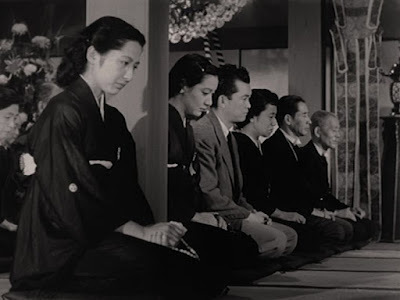 It was not until 1972, when what is often considered to be his masterwork, Tokyo Story (Tokyo Monogatari, 1953), was reopened in New York and Paul Schrader’s influential treatise Transcendental Style in Film: Ozu, Bresson, Dreyer  was published, that Ozu’s work began to receive the attention in the West that it deserved. Since then Ozu’s reputation among cineastes has only increased, and Tokyo Story has played a major role in this advancement [2,3,4]. In support of this assessment, we note that every ten years the British Film Institute conducts two separate polls – one of international film directors and one of international film critics – to rank the greatest film’s of all time. 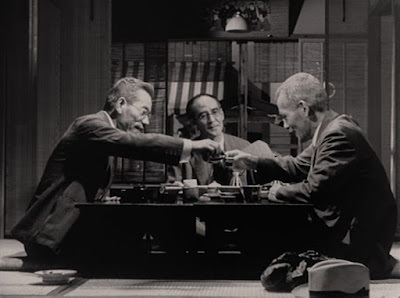 And in the most recent BFI polling (2012), Tokyo Story was ranked as the greatest film of all time on the director’s poll  and as the third greatest film of all time on the critic’s poll . Thus we often see shot transitions that “cross the axis” and also jump cuts in Ozu’s work that violate customary filmmaking standards, but this can partly be accounted for by Ozu’s different take on focalization. 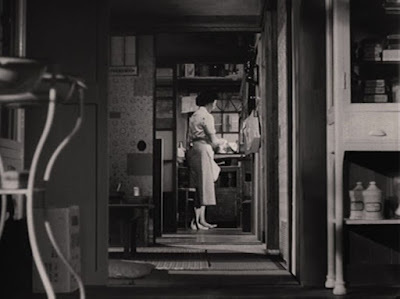 Rather than focalize on a particular character in a scene, whereby the viewer sees things from that character’s perspective, Ozu often focalizes on a static setting, which orients things around the external contexts of what is happening. These static settings are returned to again and again, and they become “familiar images” with respect to the narrative evolution of the story. 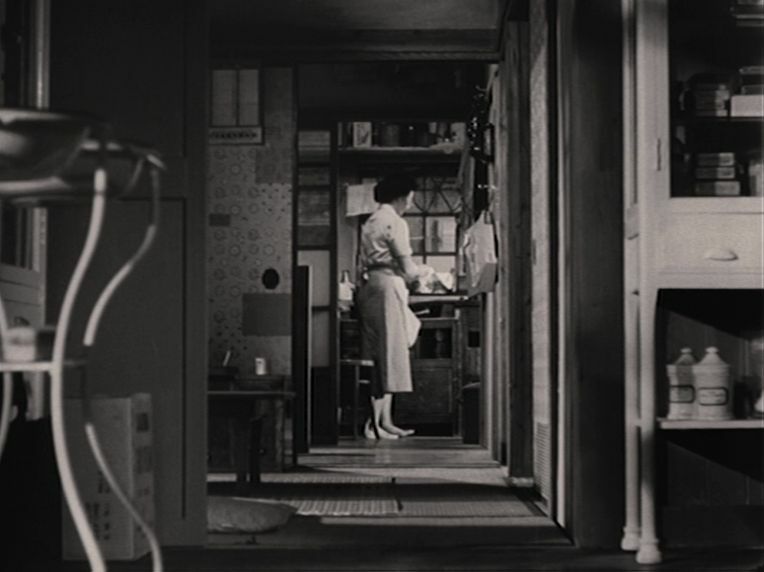 (Further, more detailed, discussion of Ozu’s distinctive mise-en-scene has been given by David Bordwell ). 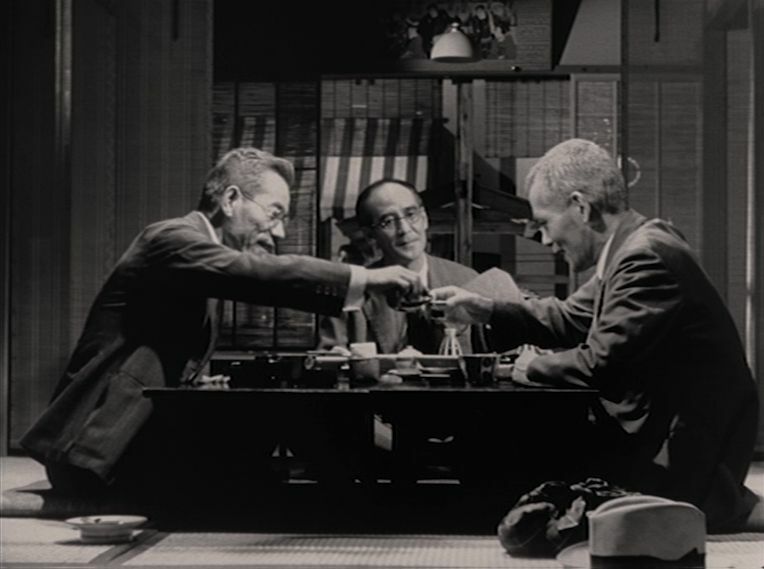 Tokyo Story offers a good example of Ozu’s often said to be “Zen-like” stylistics, even though the film’s story was inspired by an older American film. Co-screenwriter (along with Ozu) Kogo Noda had seen Leo McCarey’s Make Way for Tomorrow (1937) and suggested to Ozu that they fashion a film together based on its plot elements, which concern an older couple making a journey in order to deal with family issues concerning their grownup children. 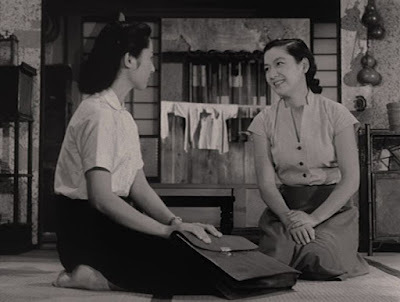 The film Ozu and Noda constructed does feature a journey (several, actually), and that always interesting narrative metaphor may partly account for Tokyo Story’s special appeal. But the journey aspect is not emphasized in Ozu’s film, and Tokyo Story’s attractiveness comes from other quarters – its themes concerning mainly life’s bittersweet nature and the unstoppable passage of time. Resignation concerning the inescapable effects of the passage of time. There is nothing we can do to ward off the inevitability of ultimate decline and death, and we must face our fates with resignation. Social protocols. The various social protocols in family life and social life, in general, are intended to regulate social interactions smoothly, but they can be seen as burdensome and insincere, especially if they are rigidly imposed. In this context the oriental custom of always smiling during conversations may play a special role. Men vs. women. 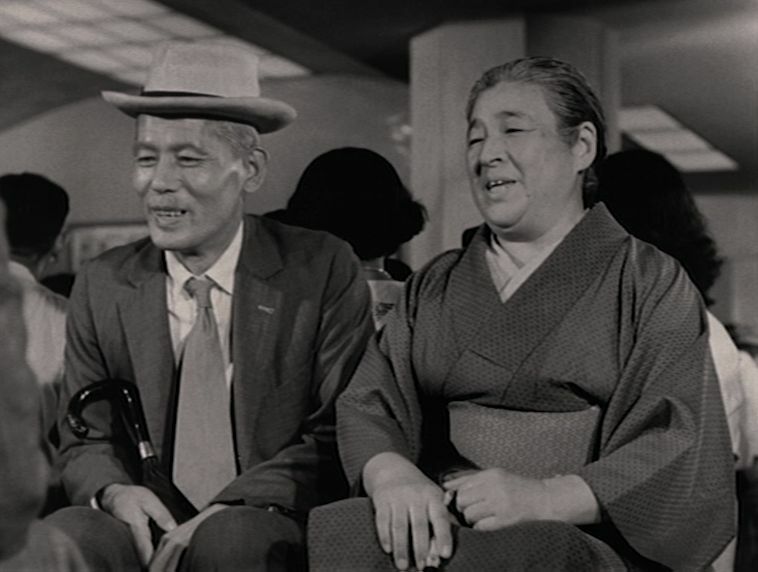 The different roles that men and women have in family life, and the different expectations to which they are held was always a fascination of Ozu’s, and they are an important consideration in this film. Japan was undergoing rapid social change at this time, in the wake of catastrophic wars and forced westernization, and the roles of women, in particular, were in a state of flux. Parents separation from children. It is inevitable that as children grow up, they change and become engrossed in their own affairs. Gradually they (usually) lose touch with and interest in their parents, whom they have left behind. How both parents and their children deal with this inevitable progression is a focus in this film. 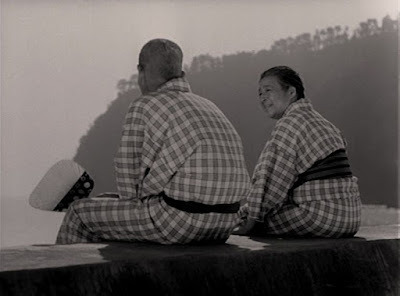 Tokyo Story’s narrative concerns an elderly couple, Shukichi and Tomi Hirayama, who have raised five children and who make the long, several hundred mile, train trip from their home in Onomichi in southwest Japan to visit some of them in Tokyo. The role of the old father, Shukichi, is played by Ozu favorite Chishu Ryu, who played in 52 of Ozu’s 54 films, including all of his postwar films. Ryu usually plays the role of a thoughtful, contemplative person, and as such, he is a person with whom the audience can empathize, even when he is not saying much. In this film Ryu, who was 49-years-old at the time, very effectively plays the role of a man who is 72-years-old. Koichi (So Yamamura), a doctor running a pediatric clinic out of his own home in a Tokyo suburb, is married and has two children. He is sober, unemotional, and dedicated to his professional work. He, somewhat guiltily, sees his parents’ visit as an unwanted intrusion into his busy life. Shige Kaneko (Haruko Sugimura) is married and runs a beauty parlor connected with her home in Tokyo. Although she wears traditional (non-Western) dress, Shige is not a traditional graciously self-deprecating lady; she is an aggressive and assertive woman. And in fact she is shown to be bossy, manipulative, and selfish. She, too, finds her parents’ visit to be an imposition. Her husband Kurazo is more mild and takes a back seat in their social interactions. Shoji, the second son, was a Japanese soldier who went missing in 1945 and is presumed dead. His widow, Noriko (Setsuko Hara), is a gracious and caring woman who goes out of her way to accommodate her parents-in-law. Setsuko Hara, who played the role of Noriko, was, like Chishu Ryu, a favorite of Ozu’s, and she appeared in six of Ozu’s best films. 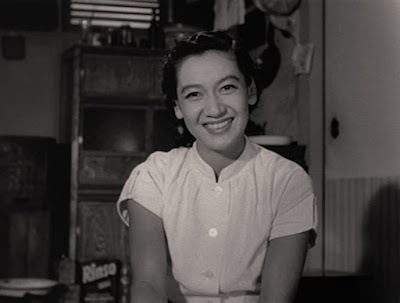 In the first three of her Ozu films (Late Spring, 1949; Early Summer, 1951; and Tokyo Story1953), Setsuko Hara played a significant character named Noriko. Even though the plots of these three films have no connection with each other, the three films are sometimes referred to as Ozu’s “Noriko Trilogy”, thanks to the glowing presence of Setsuko Hara. Keizo (Shiro Osaka) is the unmarried third son who works for a trading company in Osaka. He is well-meaning but preoccupied with his own affairs. Kyoko (Kyoko Kagawa), the youngest child, is their unmarried daughter. She still lives with her parents in Onomichi and works as a schoolteacher. The story of Tokyo Story passes through four approximate stages. The elderly couple, Shukichi and Tomi, first visit the home of their eldest child, Koichi, for a few days. But Koichi is so occupied with his own pediatrics affairs (he doesn’t even appear to have much time to discipline his own obstreperous son) that he has no time to entertain his guests. So Shukichi and Tomi shift over to their daughter Shige’s residence. But Shige is even more too selfishly preoccupied to have the time to entertain her parents. So she asks her sister-in-law Noriko to take up the task. Though of much more modest means than her siblings-in-law, Noriko graciously takes a day off from her job to take Shukichi and Tomi out on the town and show them the wonders of Tokyo. After a week or so, Shige and Dr. Koichi finally hit on a plan to relieve them of their social obligations to their parents: send the neglected couple off alone for awhile to the Atami Hot Springs resort on the coast. However, when Shukichi and Tomi arrive at the resort, they find little of interest for them to do, and the noisy atmosphere of the pleasure-seeking vacationers in attendance there merely keeps the elderly couple up at night. So they decide to return early to their kids in Tokyo. Before they depart from Atami, though, Tomi experience a dizzy spell that reveals that her health is frail. Upon returning to Tokyo, Shukichi and Tomi discover that because they had come back earlier than expected, their room in Shige’s apartment was already “booked” by Shige for a social event for her beautician colleagues. So Shukichi and Tomi obligingly decide to find their own sleeping quarters for the night. Tomi decides to spend the night with Noriko in her cramped apartment, while Shukichi choose to spend the night with an old friend from Onomichi who now lives in Tokyo. That evening Shukichi goes out drinking with old friends from Onomichi, and he and his friends get thoroughly plastered, in one of the more interesting sequences of the film. With the effects of alcohol lowering the veil of customary Japanese courteousness, the men lament to each other how disappointed they are with how their children have turned out. In particular, they are sad that they cannot take more pride in what their children have become. We later learn that Shukichi had once been a heavy drinker, which put a severe strain on his relationship with his wife; but he had sworn off alcohol when his daughter Kyoko had been born. At the same time Tomi is with Noriko, and the old woman urges her daughter-in-law not to abide by old-fashioned social protocols and to find another man so that she can remarry and start a family. Now with nothing more to do and not wishing to wear out their dubious welcome, Shukichi and Tomi decide to return to Onomichi. On the way home, though, during a stopover in Osaka to see Keizo, Tomi suffers a stroke and is taken back to Onomichi critically ill and in a coma. More mindful than ever of social protocols, the children and Noriko rush to Onomichi to be at Tomi’s side. And always attending to her practical concerns, Shige reminds the others to bring their funeral garments. But when Shige hears the ever-analytical Dr. Koichi’s grim assessment that Tomi will not survive the night, she bursts into tears. Thus we see that underneath Shige’s personal traits of selfish social manipulation, there is a substratum of genuine feminine feeling that is usually covered up. Later, though, we see Shige returning to her usual intemperance when she complains about Keizo’s late arrival just after Tomi’s death. Although Tomi was unconscious and unaware of any of the children when they arrived, Keizo’s late arrival was an unforgivable violation of protocol in Shige’s eyes. After the funeral when the family has lunch together, Shige again makes self-centered remarks, for example eagerly asking Kyoko to give her some of Tomi’s old dresses. Then Shige, Koichi, and Keizo immediately head back to Tokyo, while Noriko chooses to stay another day with Shukichi. Later Shukichi and Noriko talk, and he repeats Tomi’s urgings that she should forget about his dead son and start a new life by remarrying. Then he gives her as a departing gift Tomi’s old wristwatch that she had worn all her life. The final shots show Noriko, on the train gazing at the keepsake watch she has been given, and Shukichi, sitting alone at home, both separately contemplating life’s lonely, existential mysteries. 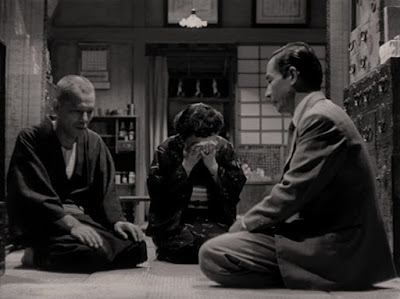 Tokyo Story ends on a note of sadness and resignation concerning the inevitability of time passing and things coming to an end. It also dwells on the limitations of social protocols if the participants don’t engage in them with sincerity. This is not to suggest that social protocols don’t have their value. They can encourage and provide the scaffolding for positive social interactions if one’s participation in them is genuine. Thus Noriko’s habitually smiling demeanor was a customary posture that may well have assisted and triggered her perpetually compassionate nature. 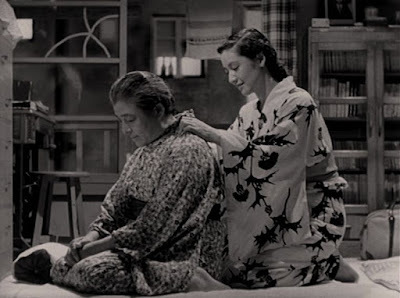 Overall, we could say that the principal characters of Tokyo Story offer somewhat different responses to the quizzical nature of time passing and the inevitability of decay. Shukichi represents benign resignation to life’s mysteries, but he also embodies a generally positive posture of engagement. Koichi, Shige, Keizo represent common character type responses that we can all recognize, both in the people we meet and in ourselves, too. They are not really bad people. They are basically well-meaning people who are distracted by their everyday narrative circumstances and lose sight of more important interpersonal considerations. It is Noriko, though, who is the special one. She at first seems simply reflexively ingratiating in an automatic sort of way, but gradually the depth of her character is revealed. Eventually we discern that she is the real star of this tale. She knows that she is not perfect and all-knowing, but she continually strives to be understanding and all-loving. David Bordwell, “Tokyo Story: Compassionate Detachment”, The Criterion Collection, (18 November 2013). Roger Ebert, “Tokyo Story”, Great Movie, RogerEbert.com, (9 November 2003). “Conversations About Great Films: Yasujiro Ozu, TOKYO STORY (1953) 136 mins”, Diane Christian and Bruce Jackson (eds. ), Goldenrod Handouts, Buffalo Film Seminars, (XXXVI:4), The Center for Studies in American Culture, State University of New York, Buffalo, NY (6 October 2009). The Film Sufi, “‘Early Spring’ - Yasujiro Ozu (1956)”, The Film Sufi, (23 July 2014). David Bordwell, “Ozu”, The St. James World Film Directors Encyclopedia, Andrew Sarris (ed. 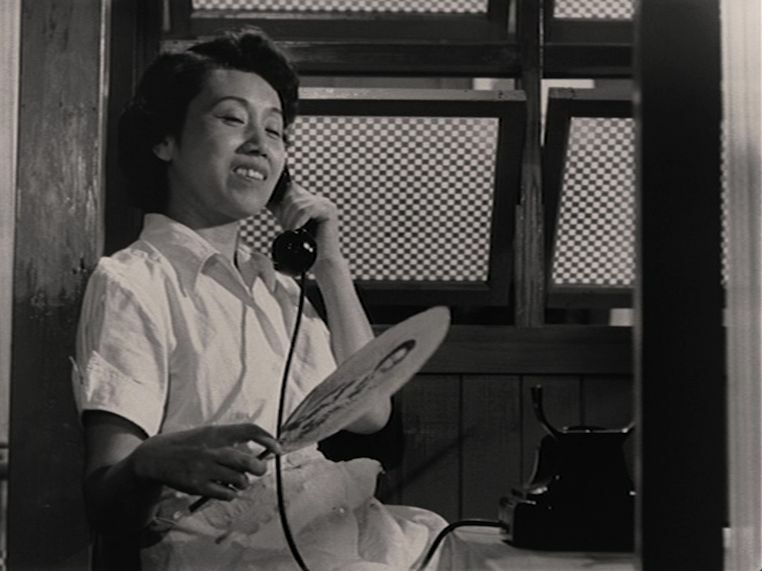 ), Visible Ink, Detroit (1998), quoted in “Conversations About Great Films: Yasujiro Ozu, TOKYO STORY (1953) 136 mins”, Diane Christian and Bruce Jackson (eds. ), Goldenrod Handouts, Buffalo Film Seminars, (XXXVI:4), The Center for Studies in American Culture, State University of New York, Buffalo, NY (6 October 2009).